Another Delco Guy In South Jersey: What Else Ya Got, Mother Nature? So we're all dug out here in Mount Laurel. School and work resume tomorrow. 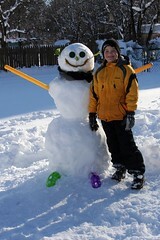 We've shoveled out the driveway and built a snowman and played video games. And now life returns to normal. The fiancee and I are headed into Philly for dinner at Marc Vetri's Amis and all is right with the world. Tomorrow we have normal Fridays followed by a weekend of birthday parties, Valentine's Day celebrations and waffles for breakfast. And then on Monday ... more snow!